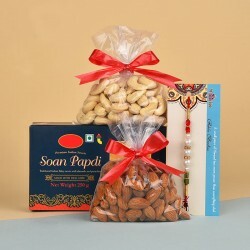 If you want something healthy to gift to your Brother on this Raksha Bandhan then we have something for you. 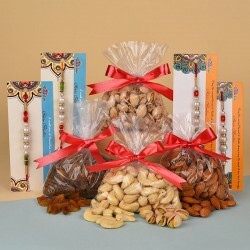 We have a wide variety of Dry Fruits that you can send to your Brother to help him build a healthy lifestyle. 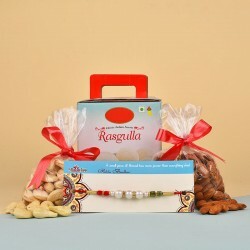 Wish him on this Raksha Bandhan with gorgeous Rakhis and nutty Dry Fruits. One of the warmest relationships in this world is that of a Brother and a Sister. To commemorate this beautiful friendship, we celebrate the festival of Raksha Bandhan. It signifies the indestructible partnership of a Brother and a Sister. It is very nutty too as sometimes these siblings fight and sometimes they spread the love. 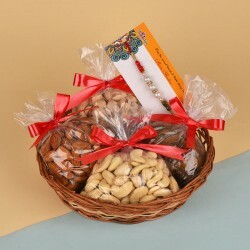 The naughtiness of this relationship can only be celebrated with some nutty Dry Fruits. 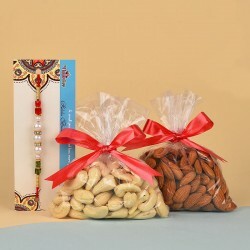 Buy rakhi with dry fruits and give this festival a healthy twist. 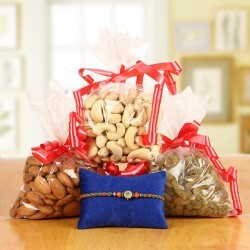 Raksha Bandhan is celebrated with utmost joy throughout India and abroad as well. Lots of fried delicacies and sweets are eaten throughout the day. 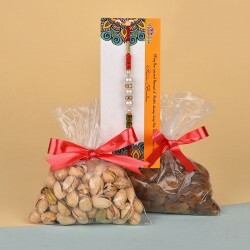 If you want to introduce a healthy factor on this festival, we suggest you do it with Dry Fruits. 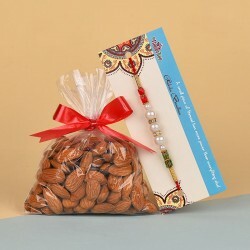 In the old days, Maharajas used to exchange Dry Fruits on special occasion. It is a royal ceremony and has gained popularity ever since. These are not only traditional but have various health benefits too. They contain healthy fatty acids and various Vitamins and minerals which help to fight with Cholesterol, Bp and Diabetes. 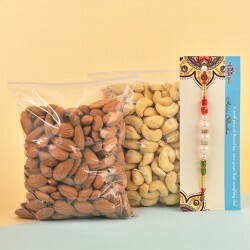 So, this year, take the healthy route and buy rakhi with dry fruits for your Brother and make him happy. 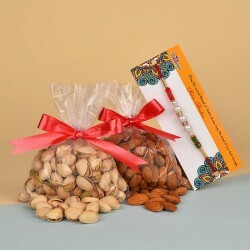 We have special thalis of Almonds, Cashew nuts, Pistachios, Walnuts and Raisins and more. No matter whether you want the Traditional way or the Modern one, we have some sweetness to be shared with you. 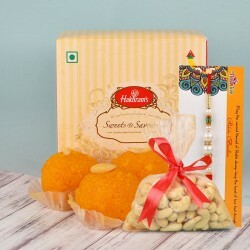 For the sisters who want to follow the Traditional route, we have some all-time favourite Bengali sweets like Gulab Jamun, Rasgulla, Rasberi, Gandheri, Kesari Petha, Kaju Katli, Soan Halwa and more. 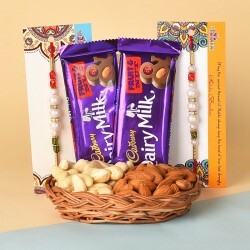 If you are the Sister who wants the celebrations to be modern, you can send Chocolates to your Brother instead of sweets. 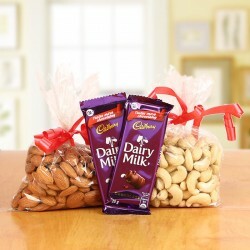 Our Chocolates Collection includes KitKat, Dairy Milk Fruit and Nuts, Temptations, 5 Star, Lindt, Ferrero Rocher, Dairy Milk Silk, Dairy Milk Oreo and more. We have many homemade Chocolates and Assorted chocolates too. Kids are the life of every celebration. They love everything colourful. We know which cartoon characters they like the most, that is why we have made a special collection of Kids Rakhi with characters like Chota Bheem, Bal Ganesha and Doraemon. We have something special for the big Brothers as well. 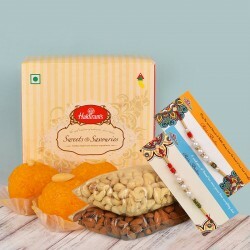 Have a look at our traditional Rakhis has some of the most preferred motifs of peacocks, elephants, flowers and many other idols of Gods and Goddesses. 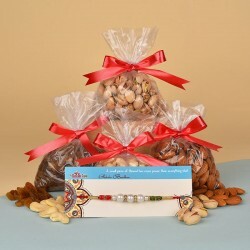 Our collection of Fancy Rakhi includes, Kundan Rakhi, Silver Rakhi, Pearl Rakhi, Rakhi Bracelets and more. Cakes and Flowers are loved by all. Surprise your Brother with some from our special collections for both. Our Collections of Flowers has beautiful and Fragrant Roses, Gerberas, Lilies, Carnations, Orchids and Birds of Paradise. Our wide Cake collection has flavours like Black Forest, Ferrero Rocher, Coffee, Caramel, Chocolate, Strawberry, Pineapple, Mango, Chocolate Truffle, Coffee Caramel, Cheesecake, Kiwi, Fruits, Oreo and many more. 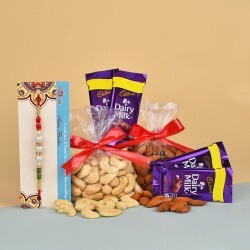 Now send online rakhi with dry fruits to your Brother with MyFlowerTree. You don't need to go anywhere as everything can be done through your Desktop. 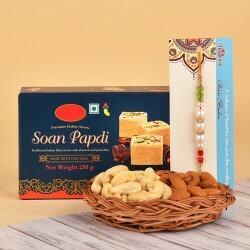 Send Rakhi to Bangalore, Chennai, Tamil Nadu, West Bengal, Rajasthan, Punjab, Haryana, Puducherry, Karnataka, Hyderabad, Chandigarh, Bihar, Jharkhand, Jaipur, Himachal Pradesh, Uttarakhand, Uttar Pradesh. 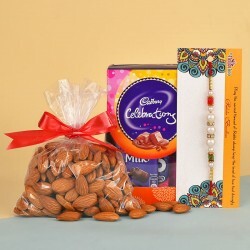 You can even Send Rakhi to Mumbai, Delhi and more, our services are available for all the major and remote cities. We deliver internationally as well and some of the major foreign countries where we deliver are Canada, Dubai, Australia, USA, France, Germany, Africa, Spain and Bangkok.